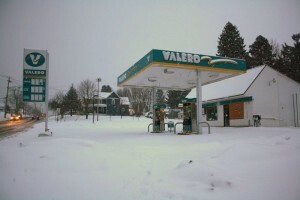 The former Valero gas station along W. 1st St. S. in Fulton, seized by the city for unpaid property taxes in April, 2009, as it appeared in this 2010 photo. Niver will pay $70,000 for the one-time convenience store. Woodward said he plans to operate a liquor store there and that the sale of the property depends on Niver getting his state liquor license. In 2011, the city borrowed $39,000 to clean up the property so it could be sold. The city had a buyer in 2010, but when the state told the city that it was responsible for the gas station’s underground storage tanks, the sale failed and the city had to spend money to dig out the tanks, remove the gas pumps and repair the property. Along with the former Valero station, two other properties were purchased by another local man. Alexander Santana bought 465 W. First St. S. and 425 W. First St. S. He plans to live with his family in one of the houses, and fix up and resell the other. Santana bought each property for $5,000, which was the minimum bid set by the city for the sale. The city owns dozens of properties that were seized for failing to pay property taxes. Council members have pressed Woodward to sell off as many properties as possible as quickly as possible. He had been pursuing a strategy of fixing up some of the homes to sell at full market rates to people who would promise to live in the homes. The city is certifying to the state that the repairs made to the broken Great Bear city water well will not harm the environment. It’s a necessary step to get the city’s largest public water well running again. The well caved in last year. Fulton Common Council member Alan Emrich holds a sign from his trip to Albany to lobby on behalf of library funding, as Council member Dan Knopp listens. Councilor Alan Emrich spent Tuesday in Albany with people from all over the state lobbying for funding for local libraries at National Library Advocacy Day. He noted that libraries are an important part of any community, but can’t handle any more cuts. Emrich encouraged people to advocate for Albany to keep libraries strong. “They are a focal point in our community,” he said, as he stood behind a sign from the day’s lobbying that said “No Cuts”. Lawmakers also approved a new contract with Pitney Bowes for a postage meter. The city pays $265 a month for the meter, which replaces the need for stamps for its correspondence. The meeting closed on a lighter note as Councilor Larry Macner reminded everyone it is once again pothole season and crews are already out patching holes. “Just be careful,” he said.